JAMstack May 2018 @philhawksworth netlify STATIC / ˈ stat ɪ k/ lacking in movement, action, or change, especially in an undesirable or uninteresting way. JAMstack May 2018 @philhawksworth netlify STATIC or ARCHITECTURE ? RESULT ? JAMstack May 2018 @philhawksworth netlify STATIC or ARCHITECTURE ? EXPERIENCE ? JAMstack May 2018 @philhawksworth netlify STATIC ? JAMstack May 2018 @philhawksworth netlify THANKS QUESTIONS @PHILHAWKSWORTH ? 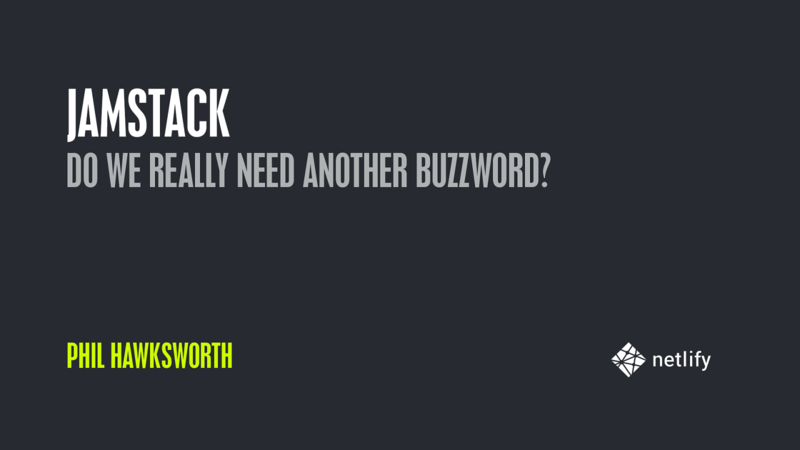 View JAMstack and Netlify - Do we really need another buzzword? on Notist. An example of using forms, notifications, serverless functions, slack, and build hooks to create a comment and moderation. A nice explanation of how to use Wordpress and its content API as the CMS for a JAMstack site. You can also use the image this generates to test locally if you're having build issues.